The new PyDev release is now out and offers some really nice features on a number of fronts! 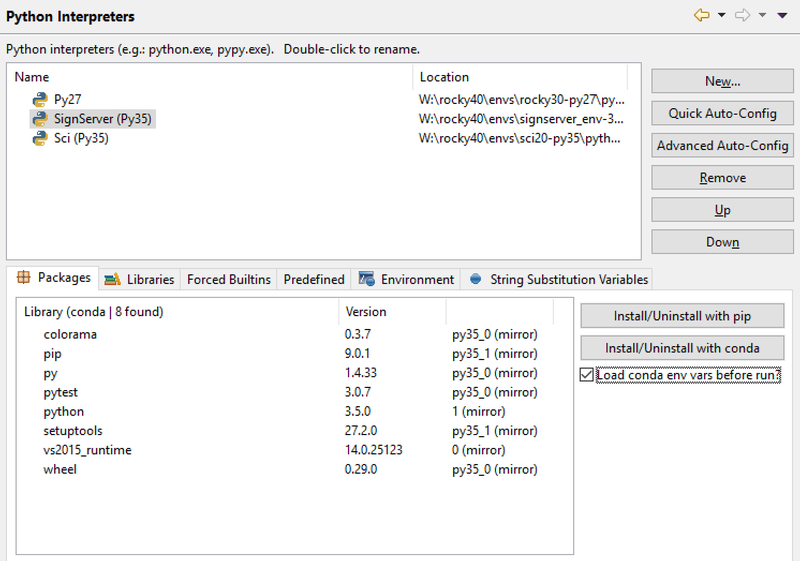 The interpreter configuration now integrates with both pip and conda, showing the installed packages and allowing any package to be installed and uninstalled from inside the IDE. Also, it goes a step further in the conda integration and allows users to load the proper environment variables from the env -- this is actually false by default and can be turned on in the interpreter configuration page when PyDev identifies an interpreter as being managed by conda by checking the "Load conda env vars before run" configuration (so, if you have some library which relies on some configuration you don't have to activate the env outside the IDE). Another change which is pretty nice is that now when creating a project there's an option to specify that the project should always use the interpreter version for syntax validation. Previously a default version for the grammar was set, but users could be confused when the version didn't match the interpreter... note that it's still possible to set a different version or even add additional syntax validators, for cases when you're actually dealing with supporting more than one Python version. The editor now has support for subword navigation (so, navigating words as MyReallyNiceClass with Ctrl+Left/Right will stop after each subword -- i.e. : 'My', 'Really', 'Nice', 'Class' -- remember that Shift+Alt+Up can be used to select the full word for the cases where Ctrl+ShiftLeft/Right did it previously). This mode is now also consistent among all platforms (previously each platform had its own style based on the underlying platform -- it's still possible to revert to that mode in the Preferences > PyDev > Editor > Word navigation option). Integration with PyLint and isort were also improved: the PyLint integration now provides an option to search for PyLint in the interpreter which a project is using and isort integration was improved to know about the available packages (i.e. : based on the project/interpreter configuration, PyDev knows a lot about which should be third party/ library projects and passes that information along to isort). In the unittest front, Robert Gomulka did some nice work and now the name of the unittest being run is now properly shown in the run configuration and it's possible to right-click a given selection in the dialog to run tests (Ctrl+F9) and edit the run configuration (to edit environment variables, etc) before running it. Aside from that there were also a number of other fixes and adjustments (see http://pydev.org for more details). p.s. : Thank you to all PyDev supporters -- https://www.brainwy.com/supporters/PyDev/ -- which enable PyDev to keep on being improved! p.s. : LiClipse 4.2.0 already bundles PyDev 6.0, see: http://www.liclipse.com/download.html for download links.